First published in France in 1976, Anne Ubersfeld's three-volume work, Lire le theatre, has made a resounding impact on the semiological study of drama. Reading Theatre is a long-awaited translation of the first volume. 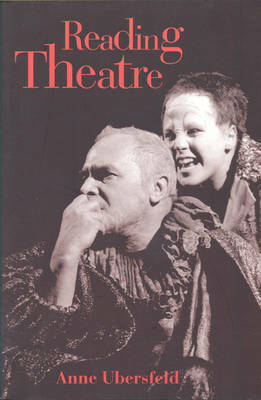 Clear and systematic in its approach, the book covers all the basic elements of theatrical text and performance. Ubersfeld begins by refuting the view of performance as the simple 'translation' of a dramatic text, and outlines a much more complex dynamic. In subsequent chapters she similarly begins with a brief critique of simplistic models and then teases out the complexities of action, character, space, time, and dialogue. A range of specific examples brings substance and clarity to her points. Ubersfeld shows how such formal analysis can enrich the work of theatre practitioners, offering a fruitful reading of the symbolic structures of stage space and time, and opening up multiple possibilities for interpreting a play's lines of action. Though firmly grounded in formalist and semiotic studies, the book exhibits a refreshing scepticism about scientific positivism, stressing the fundamental ambiguity of any dramatic text as well as the sociohistorical grounding of particular text and performance styles. A pioneering work, this contemporary classic continues to inform debates in theatre semiotics. Addressed as much to actors and directors as to students and scholars, it will be read widely in theatre circles throughout the English-speaking world.